Joe Biden was famously caught on camera calling the passing of the ACA a "BFD;" I suspect he said something similar as Secretary Kerry came back with news that a deal had been inked with Iran. I read through CNN and the NYT's summaries of the deal; I then decided to skim the full-text. The deal looks a lot like what was hammered out in April, and we discuss the key points in an earlier post. In the new version, Iran is actually restricted for 15 years (rather than 10), but gets a greater number of centrifuges (giving up 2/3 of them rather than 4/5 of them). It keeps its stockpile to 300kg (which is a 98% reduction of its current stock), ships out all spent material, and can't enrich beyond a pretty low number. The deal still looks good. A look at the full-text suggests the inspection protocols are pretty solid: the IAEA gets to maintain permanent access, and can visit facilities "daily." If Iran starts breaking the deal, the sanctions can "snap back" with a quick vote from the Western powers. The Western powers are banking somewhat on Iranian domestic support for trade with the West--Rouhani was elected president riding on promises to lift the (very painful) sanctions from Iran, and if they snapped back due to Iran breaking the deal, it could lead to more unrest (like the Green Revolution). Could Iran still hide some activity and create a bomb? Sure. But their break-out period (amount of time required to build a bomb) for the past 2 years has been 2-3 months, and now it'll extend to 1 year. Iran's had the capacity for a long time to sneak around and build a bomb; this sets them farther back from being able to do so, and increases IAEA presence (from essentially none, currently) to look for any such clandestine activity. In short, I think any objections that this is a tacit thumbs-up for Iran to build a bomb are just unfounded. Probably the big credible objection is by Sunni allies worried about Iranian power. Saudi Arabia was hoping that Iran's foray into Yemen would become a quagmire that drove it into financial ruin. The Saudis have also been intentionally keeping oil prices low (by keeping supplies high) in order to strain Iran further: they're engaged in economic warfare designed to "break" Iran's capacity to project power, and the lifting of the sanctions will undermine that. That's not untrue, but it's also unlikely that the sanctions were preventing Iran from projecting power into Iraq and Yemen. The key goal of the sanctions wasn't to grind Iran into insignificance--that was not going to happen with this package. 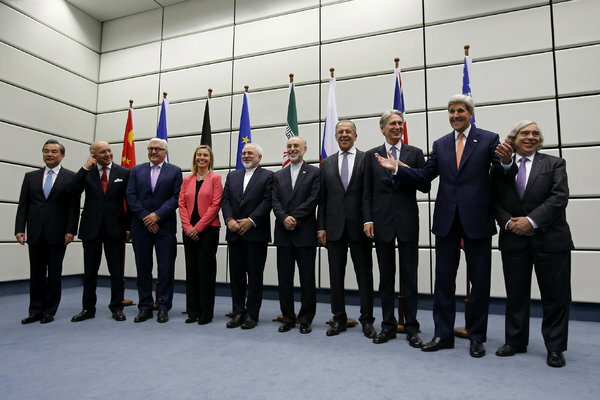 The key goal was to hurt Iran enough to make a Western-friendly deal, and that worked. If we model Iran more like a Soviet Union than a large mob of irrational terrorists (and I think the former is a more accurate model), we can think about Iran's self-interest, and what a self-interested power (even one opposed to the US) would want. The lifting of sanctions means foreign investment and an alleviation of inflation (currently 18.2%); Iran's economy stands to gain a lot. Iran's been very clear that it wants trade with the West. #2 Is important because it changes incentives for Iran with respect to the Strait of Hormuz: if Iran is exporting oil to Europe, it would hurt itself by closing the Strait of Hormuz and, per #1, would have less interest in doing so as a favor for Russia. This alleviates some of Europe's dependence on Russia for oil, and means they're more likely to have alternate sources from Qatar, UAE, Iran, and Iraq if conflict with Russia ever arises. And that means hamstringing Russia in Europe. So as odd as it may sound, the reason the Iran deal is so important is that it helps the West increase its leverage over Russia, which is a much larger, scarier, more menacing, and more aggressive threat than Iran. The Great Game in Europe is back, and this move by President Obama and Secretary Kennedy may be seen by history as a truly brilliant stroke. I'll continue to contend that the Iraqis are much better on offense than they are on defense: even with ISIS well dug-into a city and planting bombs everywhere, the Iraqis can slowly slog forward, in part because they're confident they're unlikely to get captured and tortured by ISIS troops when the Iraqi troops have managed to surround a city and besiege it. Ramadi will be like Tikrit: Iraqi forces have surrounded the city completely, and are working on shoring up supply/reinforcement lines, positioning troops, and training local volunteers before moving in. The Shiite militias, who might otherwise pose a major problem in the occupation of Ramadi, are staying on the outskirts to block ISIS reinforcements and prevent retreating ISIS troops from getting away to launch a counter-attack. In part, they'll stand "at the back of" Iraqi regulars and Sunni militiamen. Unlike Tikrit, US airstrikes will be involved from the start. 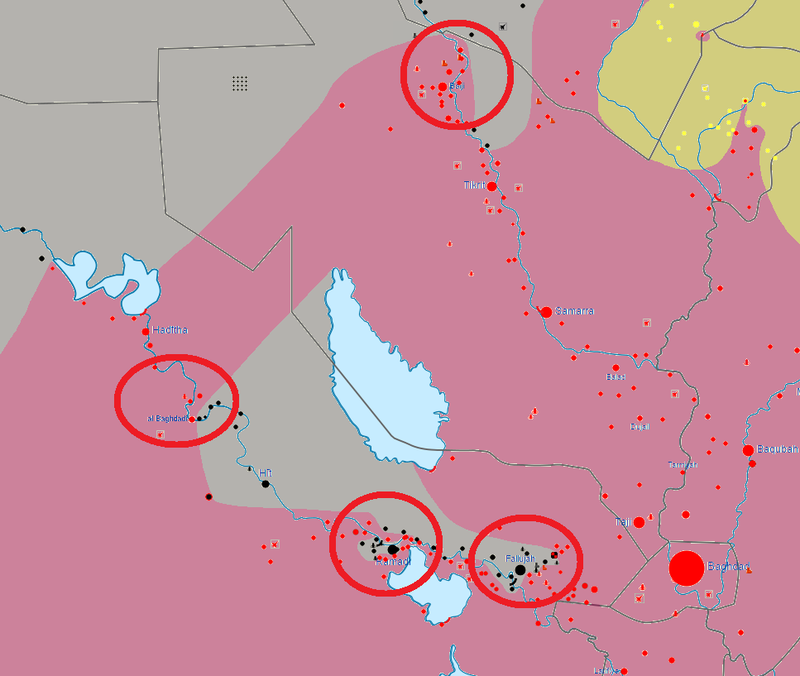 These airstrikes made the capture of Tall Abyad (Syria) and Baiji (north on the map below) much quicker. Recall that the airstrikes also ended the very stalled siege of Tikrit. Note as well that Iraqi troops are holding al-Baghdadi and Haditha, which means that reinforcements from Syria would have to go through miles of Iraqi checkpoints, and retreat from Ramadi into Syria would be difficult--again, a good sign for preventing a counter-attack in the future. The Iraqis are also working on surrounding Fallujah. The map here is actually a bit out of date: the Iraqis claim they've captured the dam and secured the river south of the city, and are "at the gates" of Fallujah. Trying to take both cities at once will be a meat grinder, but it's important: if only one was attacked and the other left open, ISIS troops could retreat from one to the other, only to counter-attack later. Besieging both means that ISIS troops in both cities are isolated (this tactic was used to great effect by the Communist Chinese forces against the Nationalists), and the Iraqis can take their time, advance slowly, and strike where ISIS has been softened up by airstrikes. In Anbar, time is on the Iraqis' side. Because they're training local militiamen--in large part to keep the peace after the fighting as credible local forces--they may even stretch out the operation, as painful as it seems to consider. Forces from al-Baghdadi may also advance towards Hit and try to guarantee no safe haven for ISIS troops after the Ramadi and Fallujah assaults. This is a case where Iraq's strategy is to accept the hard fight, take the American's help, and try to eliminate (rather than simply dislodge) ISIS forces in Anbar. Doing so will mean that fewer troops will have to stay behind to garrison Anbar (and many fewer will need to garrison surrounding Baghdad, which remains under threat from ISIS' presence in Fallujah), and thus that more can be committed to the final brutal push towards Mosul. Expect fighting in both cities to start up within the week. Steve, a friend of mine in the US Army, pointed out a very key inaccuracy in our previous post about the US armored brigade in eastern Europe: it's not a manned brigade, currently, just the equipment. This changes the rationale from being a "spiral deterrent" to being a "fast-response force." US troops can be deployed to this equipment within hours, which means they can go be a "speed bump" of sorts for any Russian invasion. Since these are NATO countries, the US won't need to waffle and quibble about a response the same way that it did with Ukraine: US troops could credibly show up and start shooting as soon as there's a problem. It's not 100% clear that the current US administration would do just that, but deterrence is a game of probabilities: just what has been said between Mr. Putin and Mr. Obama behind closed doors? How much has US resolve stiffened in the face of Russian aggression? I assume that the Obama administration has posed some credible ultimatum to go along with the armor. It means the high risk of escalation (and lower likelihood of success) for any Russian invasion remains, especially in a country like Estonia (which could otherwise be totally occupied within a day).